1. It encourages collaboration so every employee can be successful. Every employee wants to be successful in his or her career, right? Well, if you want to be sure that your company cares about you as an employee, make sure it's giving you the support you need to succeed. If you work for a company with one of the best reputations in the industry, then you are continuously working to produce the highest quality products. The best way to do that is to collaborate with those around you by sharing ideas and providing feedback to ensure that you're creating products that your consumers will love. At Nike, one of the world's largest athletic companies, employees constantly support one another to ensure everyone is doing their job to the best of their ability and producing the highest quality product. "Nike as a corporation is very team-centric," said Danny Modesto, Senior Engineering Manager at Nike. "There's no one person in charge of everything. We are all in it together." 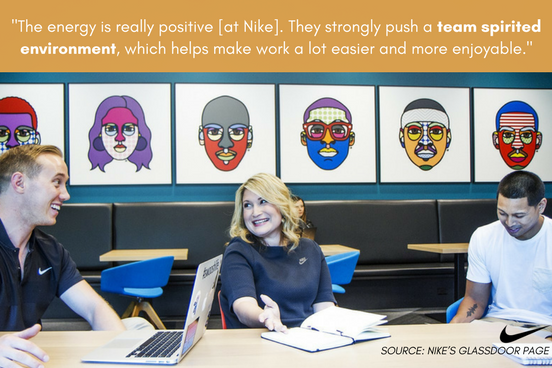 By encouraging collaboration amongst employees, Nike is ensuring that everyone is working together as a team to contribute to the company's success. It's easy to come into work every day, go through the motions, and then go home. However, if you really want to feel fulfilled in your career, you need to find a company that will invest in you and your success. When a company invests in its employees, those employees will feel excited and appreciative to walk through the door every day. As a result, they are going to be increasingly valuable to the organization. At Nike, it is this investment in employees that brings energy to the brand and helps drive the business forward in order to stay at the forefront of the athletic industry. "We know that diverse teams fuel innovation. So we work to ensure that we have diverse teams," said Nike's Director, Diversity & Inclusion, Anthony Herrington. "How we get after this work is educating our managers, hiring more inclusively, investing in our talent, and looking beyond Nike to make change in the world." 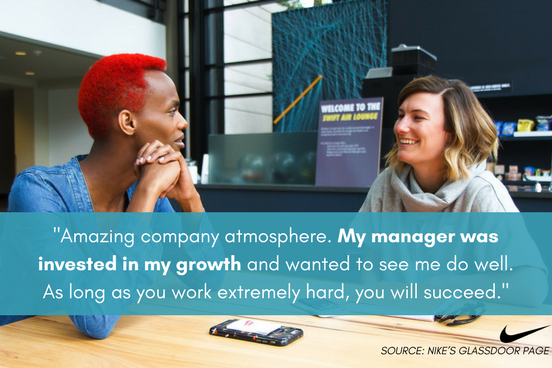 Nike understands that investing in its employees and acknowledging their dedication and hard work, will help make for a positive atmosphere where everyone is committed to producing their best work. It's like they say, "two heads are better than one." An employee may be able to perform well when he or she is working alone, but when he or she is sharing feedback and collaborating with a team, that's when the best ideas will come out. An ideal work environment is one where everyone's ideas are welcome. When a company encourages collaboration by inviting everyone to share his or her perspective, that's when the team will deliver the best possible product and/or service. "One of the things I love about working at Nike is how diverse it is here in how we look and what we believe," said Nike's TA Director, Nike Direct, Jenn Longbine. "Walking around campus is a really cool thing. You'll hear different languages, you'll hear healthy debate. It's a place that fosters inclusion in a way I've never seen." 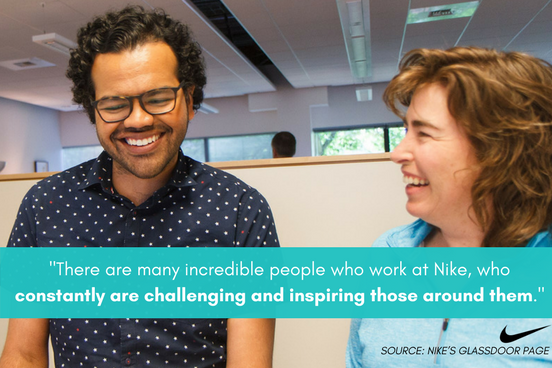 If you're looking to work in a positive work environment, then you want to find a company that values teamwork and inclusion, like Nike does. This kind of atmosphere will help you excel in your career and will mold you into the best professional you can be. Are you looking to start a career with a company that will value you? Be sure to look out for these three signs that a company truly cares about you as an employee. If you're interested in joining Nike's team, then take a look at its open positions today! If you're thinking about moving to pursue a job, here's why you should relocate to Portland, Oregon.